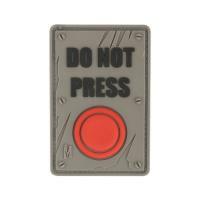 Dare others to touch that bright red button and suffer the consequences with the "Do Not Press" Morale Patch from Maxpedition. These entertaining patches are made using PVC rubber, guaranteeing a sturdy construction that is effortless to clean and maintain. The patch features a hooked-backing that will interface with any looped panel surface, including those on most Maxpedition bags. The patch also includes an extra loop panel to protect the hooks when not in use, but it can be sewn onto any fabric surface for more permanent wear. Show off personal style while keeping morale and spirits high with this Maxpedition patch!